It’s been my experience that people who take care of their homes, families, and careers know instinctively that it will all fall apart if they don’t take care of themselves first. Lately I’ve been thinking about how that applies to SMBs. Successful business owners and operators know their company must be in top form before going into a new venture or adding a new branch to their existing business. You can’t make wealth without health, as they say. Focusing on what drives our businesses is like taking in the fuel that powers us as people. We’ve all heard some good, basic diet advice: Jot down everything that goes into your mouth for a week or two, so you know what you’re really eating. But don’t put anything completely off limits—and no crash diets. A forbidden foods list is just discouraging, kind of like shelving an idea without researching it first. Think about how learning how to eat properly translates to running your business: Keep track. Continually evaluate which activities are the most profitable, the most sustainable, the most beneficial to the well-being of your enterprise. But don’t put a guilt trip on yourself if you aren’t focused solely on the top items on your to-do list. People who like their work are more effective—just take care not to shift into only doing the most enjoyable tasks and letting those boring, tedious ones slide. It’s never healthy to stop feeding your business intelligence. Nourish it well with outside professional advice, sharing among peers, and maybe a class or two. The internet has made it easier than ever to do this. With the proliferation of business blogs and forums, though, watch out for junk food. Garbage in, garbage out. Find the most reliable financial and entrepreneurial sites and make them the mainstay of your diet. But don’t forget to take a gander at the minor players too—they are often entrepreneurs or small business owners like you and are typically the ones talking about the latest technologies and innovative ways of operating. Chances are good you will come across a savory tidbit of business savvy on one of their blogs (maybe even this one). Just because something is a tantalizing idea doesn’t mean it’s going to be profitable. After you do the research and make a solid plan, play devil’s advocate and try to talk yourself out of it. Find reasons it might not work, so you can plug those holes before you make the decision to go forward. Be careful with this one. Your eating habits will surely outstrip your exercise if you keep a lot of the wrong kinds of food around. That’s a lot like your company having out-of-date stuff and other items gathering dust on the shelves instead of shipping out to your customers. What are some other signs that you need to look into your inventory management system? You wouldn’t let yourself get undernourished, so don’t starve your business either. Keeping enough cash reserves is crucial to its health. It’s recommended that you have enough easily accessible cash to last about six months. Consider how quickly your providers expect payment. If you offer credit, you’ll need to cover these expenses until you can collect. And don’t forget to factor in your personal expenses. Just as regular exercise keeps veins and arteries more elastic to stretch when needed, elasticity is desirable for your business. SMBs, in particular, need flexibility because those that don’t respond quickly to changing markets, new technologies, and new ways of doing things often fail. So, dig deeper into what you learned out on the business sites and analyze what works best for you. Small businesses that thrive and not just survive are the ones whose owners are willing to step out, be adventurous, and take some calculated risks. A strong circulatory system is a result of cardiovascular exercise and a sign of good health. In the same way, cash is the lifeblood of your company, so keep it flowing. What better way to improve your cash flow than to collect accounts receivable faster? Here’s one way to do that. With exercise, you have to build up incrementally or you’ll suffer the next day and have to scale way back or even suspend your exercise routine. And you know how hard it is to get started again! It’s no different when you suffer a business setback because your growth outstripped your resources. It’s way too common that small businesses get ahead of themselves, depleting their cash reserves or taking out credit they can’t really afford. Before you invest in gearing up to take on that big client, ask yourself what will happen if they pull out. This is not to say that you shouldn’t go for it—see “Flex Those Muscles,” above—but make sure you have a large enough base of smaller customers to stay in operation if the big one walks away. Rest times between bouts of intense exercise allow your body to replenish its energy stores and repair damaged tissues. Likewise, in your business, it’s unwise to keep up a constant hectic pace. Allocate your own efforts wisely and don’t run your personnel ragged. If you do, you’ll surely undermine the cooperative team spirit you’ve been trying to build up (you have, haven’t you?). Find a maintainable pace, and you’ll all be better able to handle bursts of high activity when they’re called for. And they will be called for! When your business is humming along, you may feel a little guilty if you’re not making another big push. Although you certainly want to have everything running smoothly before you launch an initiative or a new product or release, sometimes it’s wise to let the business catch its breath first. And, while you don’t want to rest on your laurels, it’s not a mistake to let things stabilize for a time. It will inspire you and your staff to go on to even greater things if you pause just long enough to give yourselves the credit you deserve. This is when some of the best training takes place. On the day-to-day level, taking real breaks—not talking shop but getting your mind completely off the business for a few minutes—will make you more productive in the long run. Right about now, you’re thinking, “OK, so you’re saying I should a) set aside time for research, b) implement some new ideas, and c) take it a little easier sometimes. How in the world am I supposed to find time for all that!” One proven way to lighten the load is to outsource to internet business-to-business services duties such as purchasing supplies and equipment and filling out government forms. Consider farming out any repetitive and mundane tasks, especially those that can be done cheaper and more efficiently by businesses that specialize in them. The way you think of investing company funds is the same way to think of allocating your employees’ and your time: when you invest this precious capital, keep your eye on the ROI—what are the most profitable uses of time within your organization? Your client data gets hacked and you lose most of your customer base, or a natural disaster hits your area, or a key player goes down. Do you know how to respond to the things that can injure your business? If not, then odds are you don’t have an adequate disaster recovery plan in place. Come up with every worst-case scenario you and your staff can think of, but also consider the potential impact of events that, while not catastrophic, would hit your business hard—a machine breaks down, a provider fails to deliver, your hard drive crashes. If a few of these lesser disasters happen in rapid sequence, they can add up to a catastrophe. Be prepared, and your company will be more resilient. Know the basic first aid for your type of business. You don’t necessarily have to know how to remedy every possible scenario, but you do need to keep a list of where to go for help. Yes, write it all down. Make sure everyone knows how to get to the information—don’t assume you will be on the spot to tell them what to do. Keep a backup of the list; don’t count on being able to access your hard drive or even being able to reach the internet. No critical-path task for your SMB should reside with only one person. The steps to completing every process should be well documented, and that documentation needs to be updated any time a procedure is modified. Make sure someone can cover for anyone who is unexpectedly out of commission or is out of reach when an adverse event strikes. This is why in a small business or a startup, the people you bring on first must be willing to pitch in wherever needed. Here’s a great tip: Look for versatility in the hobbies and interests listed on their resumes. You as the owner need to be able to perform as many tasks as possible in a pinch, or at least know something about how they should be done. So, get your knowledgeable staff teach you and each other the essentials of what they know. When it comes to owning or operating an SMB, not only is a desire to learn invaluable, so is a desire to teach. When hiring, look for people who don’t jealously hoard their knowledge but rather have been involved in some type of mentorship—or would like to be. OK, that’s a terrible pun. Sorry. 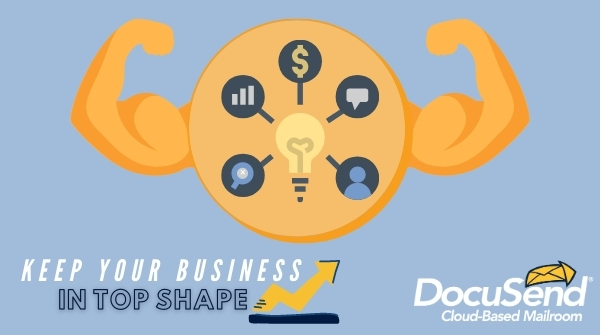 What we mean to say is, just like stepping on the scale, know how to measure your SMB’s progress, and do it regularly. Monitor your vital signs: Are the ways you’ve always done things still working? Are you still setting the right price on your product or service? Go back over your cash flow projections often enough to make sure all recently added expenses are reflected there. Ever known anyone who does two hours of cardio a day but still drives around the parking lot of the fast-food place looking for the closest parking space? Or someone who eats right every day but never so much as takes a walk around the block? Well, ask yourself if you resemble them in any way. Many small businesses fail because the founder tries to go it alone. The founder is often the type who can come up with a brilliant idea and then make it happen, but the smart ones know they need to team up with people who will attend to the details that keep everything going. Or maybe you are a small business operator who at times can get caught up in the particulars. You need a visionary alongside to keep the big picture in view. Join up with people whose strengths complement yours, and be sure to let them know how much you value them. Share your benchmarks and successes with other SMB owners here in our comments section. It’s challenging to keep our businesses healthy. Let’s support and encourage each other! *Entrepreneur-> How to Tell if Your Business is Healthy...or Floundering.